New Delhi, Nov 2: Owing to a sedentary lifestyle, over 35 per cent of teenagers in Delhi are obese or overweight, a condition which majorly impacts their emotional wellness, confidence and self-esteem, and paves way for depression and other illness, finds a survey. The survey, titled "Juvenile Obesity", showed that 38.5 per cent of children aged 5 to 9 years were obese, while in the 10 to 14 years age group, 40.1 per cent were overweight. The survey was conducted over 1,000 children from Delhi. As a result of obesity, 29.7 per cent children experienced a dip in "happiness level", 28.3 per cent became "less social" and 20.2 per cent become "more irritable". Obesity not only hampered their physical life, but also productivity, self-esteem as well as emotional wellness of children and adolescents, the survey noted. The rise in obesity among the teenagers can be attributed to various lifestyle choices such as unhealthy eating habits, poor physical activity levels, less sleeping habits as well as increasing screen time, peer pressure, among others. "They (the children) do not burn any calories after their eating late at night as they sleep after that and at the same time during the day, they are lethargic thus burning very less calories in the day," Pradeep Chowbey, Chairman of the Department of Minimal Access, Metabolic and Bariatric Surgery at Max Healthcare, said in a statement on Friday. "Moreover, the increasing screen time in children these days causes a lot of emotional and hormonal changes. Stress hormones and steroids production is increased in the body which in turn increases the appetite thus contributing to weight gain," he added. Moreover, over 26 per cent obese children reported experiencing bullying, while 25 per cent suffered from body shaming. The stress caused by these pressures, causes stress and impacts a teenagers' confidence level and social life, which in turn causes binge eating. 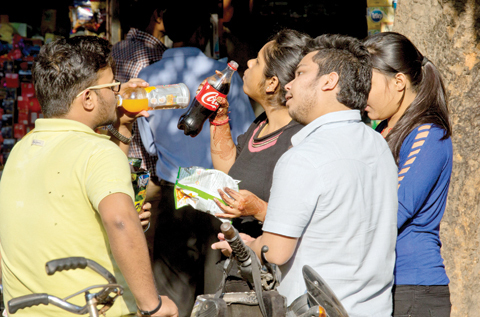 The survey showed that 84.7 per cent of teenagers consume junk, aerated drinks or chocolates two to three times a week.